London is currently the most visited capital city in the world after overtaking Paris in 2014. London is one of the most tweeted capitals in the world of social media. Have a look. If you are visiting London then remember to bring a proper camera. The smartphone cameras are fine, but not good enough if you really want to capture the best images of London. 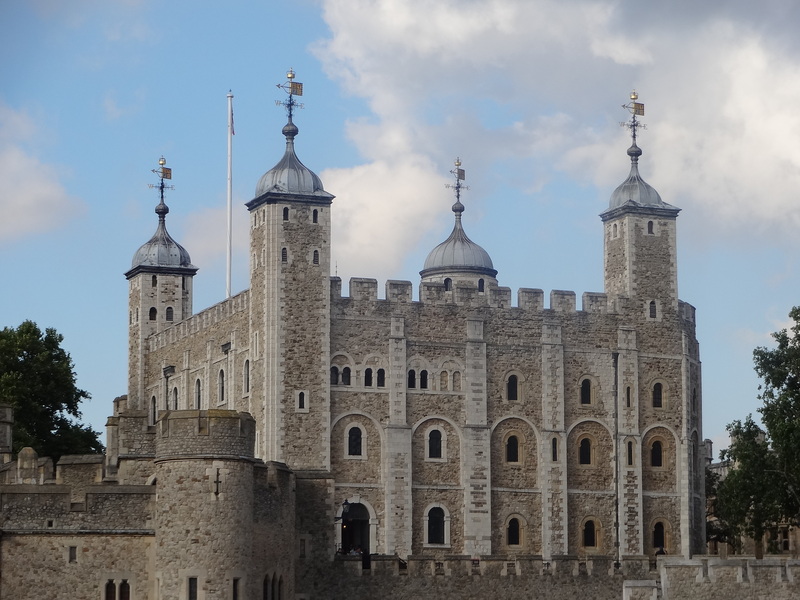 A tiny Sony Cyber-shot with 10x optical zoom would be better than most smartphone cameras, it can also take a 32GB memory card and is easy to control for any selfie photos at landmark sites in London. See some of the amazing Images of London on the Pinterest board below. My view of London is through the lens of parties and events at some of the best venues in London. You can follow my journey via Twitter/bigsands or follow my journey on the ground in central London by checking out my footprints. I have a favourite place that I like to visit for breakfast which is Paul’s Cafe, 29 Bedford Street, London WC2E 9ED. I usually have an omelette with freshly baked bread as the cafe has a bakery on site and you can treat yourself to freshly made cakes and tarts as well. The decor gives this place a special ambiance and the service is also very good. After breakfast at Paul’s, one of my favourite shops is just around the corner on King Street, it’s the Oakley store. I wear lots of Oakley and have Oakley polarized sunglasses. You can check out the quality of their merchandise and treat yourself. After a visit to the Oakley store, I would usually walk down to Somerset House and have coffee on the terrace for an hour or so as the sun is always shining on their terrace and the view of the Embankment is good. Next, I would either walk along the Embankment up to Big Ben or if the weather is really good, I would head up to the Trafalgar Hotel and go up to the roof terrace. This is quite a lot of walking for most people, so you will need comfortable footwear. From there you get an excellent view of Trafalgar Square. From this vantage point you can try my photo challenge which is to take a photo with as many red buses as possible. My record is getting 9 red buses in one photo. If you manage to beat my record, please send me the photo via twitter/bigsands. The views from up there are amazing, but this comes at a price; it is not a cheap bar. The good news is that there are many venues with roof terraces and outdoor spaces in London. On some visits, I just walk straight over from Covent Garden to Trafalgar Square without stopping at Somerset House. There are always street performers in the Square and you will even see someone pretending to levitate as Master Yoda from Star Wars. 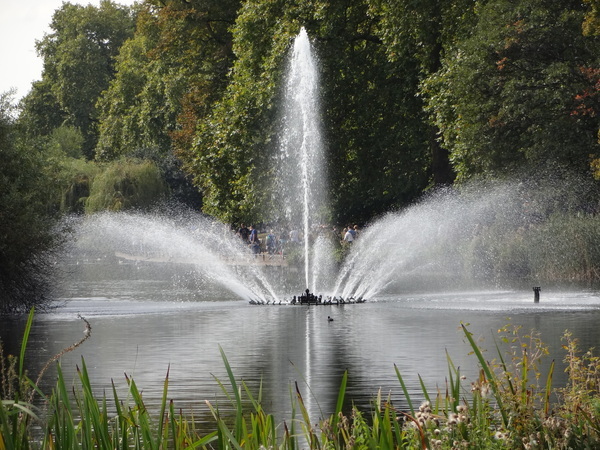 Moving on, I would walk across Trafalgar Square and over to Whitehall, then through Horse Guards Parade and into St James’s Park. 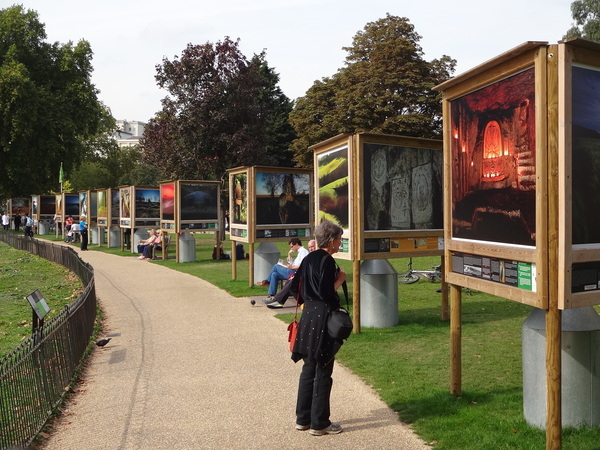 The park has a very friendly atmosphere and there is artwork on display. Sometimes, I would walk from Trafalgar Square, all the way over to Jermyn Street to see which of the menswear shops have a sale. I also like to visit a shop called Favourbrook to checkout waist coats for the band and visit another boutique called Andy & Tuly which is in Princes Arcade, Jermyn Street. 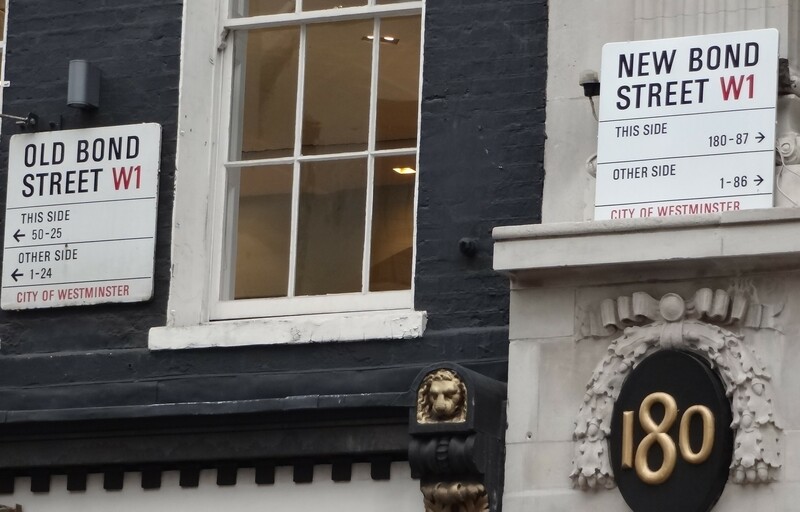 You can continue from Jermyn Street and within a 10 minute walk, you can find yourself on the best street for designer shops and luxury goods in London, New Bond Street. You may even see some celebrities doing their shopping at designer stores like Bulgari, Chanel, DKNY, Emporio Armani, Gucci and Louis Vuitton. For me, it’s very inspiring to walk along New Bond Street. On my last visit, I bought a pair of metal frame Emporio Armani sunglasses which I have been wearing this summer at weddings and parties. You can see an image in my Twitter gallery. 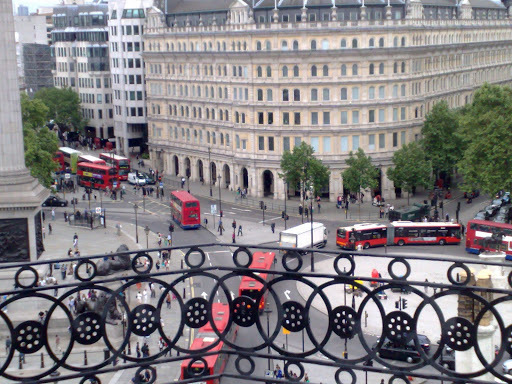 Moving on, after New Bond Street, if you are still feeling energetic, then Oxford Street is very close and my favourite place is the menswear section on the first floor of Selfridges. This is a huge store and you will find many things to buy. It can be crowded, so avoid the peak times. I hope you enjoy the suggestions and you are welcome to tweet me via Twitter/bigsands.